to $92 on Solar Covers Deals of the Week End Monday! Doheny’s Pool Supplies Fast has Free Shipping! This not only covers our brand name chemicals but also our most popular swimming pool supplies. A handling fee will be applied to all orders. For certain products, a freight charge may be applied. 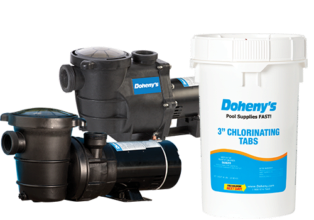 Doheny’s is pleased to offer free next day delivery at no additional charge to most of the US for all Doheny's brand chemicals and many of our most popular swimming pool supplies. Next Day Delivery Service does not mean Next Day Air, but simply that your qualifying products will be shipped from the warehouse closest to you resulting in delivery the next day. Other than for Pleasant Prairie, Wisconsin, not all products are stocked at all locations and therefore not available for next day delivery. Only those items with a Next Day Delivery designation on the product page can be expected to arrive the next day and orders must be placed by 4 pm local time (exceptions include areas serviced by our Florida, Texas, and Tennessee warehouses: Florida by 2 pm, Texas by 2:30 pm and Tennessee by 3 pm). If you reside in the next day delivery area served by our Pleasant Prairie facility, order in-stock products and place your order by 4 pm CST you should receive your order the next day (except Saturday or Sunday). This applies to products even if they do not have a Next Day Delivery designation. Because next day delivery is not guaranteed for standard service and residential deliveries are made only Monday through Saturday though Saturday delivery is not guaranteed, there is a chance that our product will not arrive the next day. While we try our best, unexpected demand can cause products to occasionally be out of stock or create a warehouse backlog that also can prevent shipment the day of the order. This item ships from our vendor partner and usually arrives in 3 to 10 business days. This item ships from our vendor partner and usually arrives in 3 to 10 business days. You will be notified when your item ships. The Shelving System 2 Level Work Bench is perfectly sized to fit inside all of Palram hobby greenhouses and will help you create a well organized growing space. The bench tops are 19 5/8" x 45 1/4" each. It will keep your plants off the ground while increasing the capacity of your greenhouse. The galvanized steel construction is designed for the tough greenhouse environment while the smooth surfaces allow for quick and easy clean up. The Shelving System comes complete with hardware, instructions and is easy to assemble. Sign up and Save Now! Shop with confidence at Doheny's. Our volume discounts guarantee the absolute lowest prices on all of our products: swimming pool supplies, chemicals, equipment and more. To prove it, if you find a lower total delivered price by a licensed and authorized pool supply catalog or website (excludes auctions), we will refund you the difference. We will even guarantee our Low Price for 30 days after your purchase. Simply contact our Customer Care Team at: [email protected] or call us at 1-800-574-7665 to report the lower price. After verification, the difference will be promptly refunded. Doheny's is not responsible for inadvertent price or text misprints or errors. Some restrictions apply - call for details. Doheny’s Pool Supplies Fast has Free Shipping! This not only covers our brand name chemicals, but also our most popular swimming pool supplies.